Diaphragm type dosing pumps are the sturdily constructed dosing pumps widely used in a number of industries. These are leak proof and widely used for highly aggressive or toxic media. 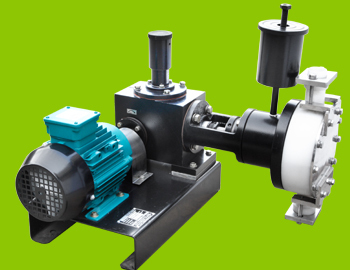 Technically advance range of these pumps is fitted with a separation chamber as standard, which protect its medium from flooding the system components or the pump itself in the situation of crack. Besides, these medium sides of this diaphragm are coated with PTFE to ensure safe usage. These are engineered from high quality components and following international industrial standard. Hydraulic Actuated Diaphragm Type Pump is membrane type pump which has good suction lift character. Heavy-duty hydraulically actuated tubular diaphragm pump specially designed to ensure free flow performance in high capacity and high pressures situations also. Our pumps are specially designed for corrosive liquids including H2SO4 or slurries. Engineered under the firm direction of experienced team members, these handle inconsistent suction conditions and suction lift capabilities to 16 feet. These are straightened with Easy maintenance cartridge type check valves, Hypalont and Vitont diaphragms and Single and double ball check valves to ensure better performance.